As a follow-up to the Mineral/Santa Fe discussion – Is traffic congestion on westbound Mineral being considered with the RTD expansion plans and the Santa Fe Park (Ensor) development? It seems these development plans will only make a bad situation worse. When a new development or redevelopment of an existing parcel in the city takes place, the city’s Public Works/Engineering and Community Development departments always review the proposed land uses for traffic impacts. One question that often arises is, “Can the city deny a development proposal based on traffic?” From a legal standpoint this is a very difficult approach to take and Colorado’s legal system has historically been very supportive of property owner rights when it comes to development. The City of Littleton is currently in the midst of a project to enhance and implement Transportation Design Standards for both existing and future projects. These enhanced standards will include Level of Service standards for intersections that will give the city a great ability to assess and address traffic impacts from development. This practice is already common throughout the Front Range. 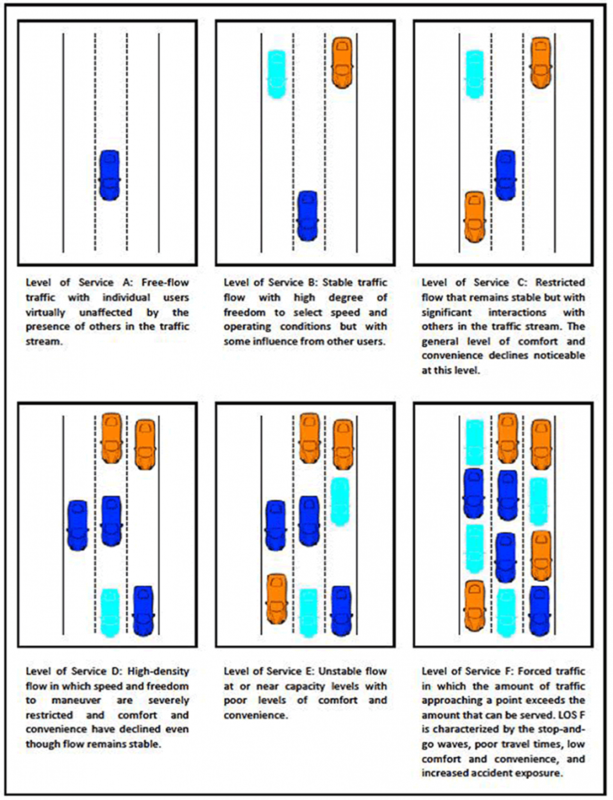 This diagram from Teach Engineering shows a good example of Level of Service (LOS). Often times, an intersection can operate at LOS-A or LOS-B most the day, but falls to LOS-D or LOS-F during the peak morning and evening rush hours. As discussed during the Town Hall, traffic and congestion is an issue that Littleton’s leaders recognize needs to be addressed. If and when the South Santa Fe Park property to the south of Mineral Avenue (Ensor), is proposed to be developed, traffic and vehicular access would be part of the review process and requirements would be put into place based on the land uses proposed for that property. The RTD Mineral Avenue Light Rail Station does not include any expansion plans that the city is aware of at this time. Littleton, through a grant from RTD, is in the process of drafting a Mineral Avenue Action Plan, and it will encourage continued regional discussion and cooperation to address the traffic issues on S. Santa Fe Drive and especially at the Mineral intersection.